A portable biomolecular manufacturing method, developed by a team at Harvard’s Wyss Institute for Biologically Inspired Engineering, can produce a broad range of biomolecules, including vaccines, antimicrobial peptides and antibody conjugates, without power or refrigeration. In remote areas lacking power or established transport routes, modern medicine often cannot reach those who may need it urgently. The World Health Organization states that one half of the global population lives in rural areas. And according to UNICEF, last year nearly 20 million infants globally did not receive what we would consider to be basic vaccinations required for a child’s health. These daunting statistics are largely due to the logistical challenge of transporting vaccines and other biomolecules used in diagnostics and therapy, which conventionally require a “cold chain” of refrigeration from the time of synthesis to the time of administration. In a new paper published September 22 in Cell journal, the team has unveiled what they set out to deliver, a “just add water” portable method that affordably, rapidly, and precisely generates compounds that could be administered as therapies or used in experiments and diagnostics. 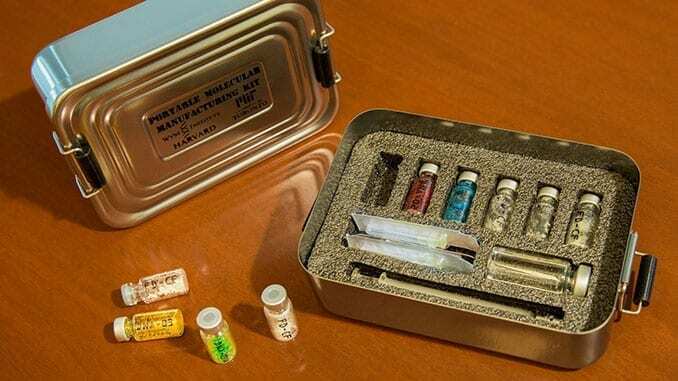 The approach, called “portable biomolecular manufacturing” by Collins’ team, hinges on the idea that freeze-dried pellets containing “molecular machinery” can be mixed and matched to achieve a wide variety of end-products. By simply adding water, this molecular machinery can be set in motion. Subsequently, the team envisions that the method could be employed to create batches of tetanus or flu shots routinely manufactured in remote clinics. Vaccines against emerging infectious disease outbreaks could quickly be mobilized in the field to contain spiraling epidemics. Episodes of food poisoning could be dosed orally with the production of neutralizing antibodies produced on the spot.